Squishy, colorful, and infinitely shape-able, clay is a marvelous art material for kids. 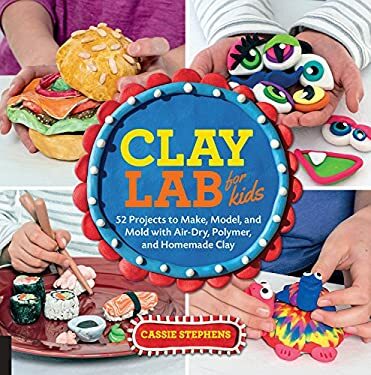 Clay Lab for Kids, a new addition to Quarry's Lab series, focuses on kid-friendly clays that are safe and easy to use at home or in the classroom: no kiln required. Nashville art teacher Cassie Stephens makes clay a focus of her elementary school classes with amazing results. In Clay Lab for Kids she continues her creative explorations with 32 hands-on projects. The book begins with the trio of ceramic basicsa slab, coil, and pinch potsa and moves on to 3-D sculpture, 2-D relief design, carving, incising, embossing, hollow-work, modeling, molding, group projects, and even claymation. In creating with clay, kids are introduced to a wide range of cognitive and manual skills: they'll work three-dimensionally, make figurative models, construct large pots and minuscule beads, make jewelry and toys, design with color, and decorate with glazes and paints.